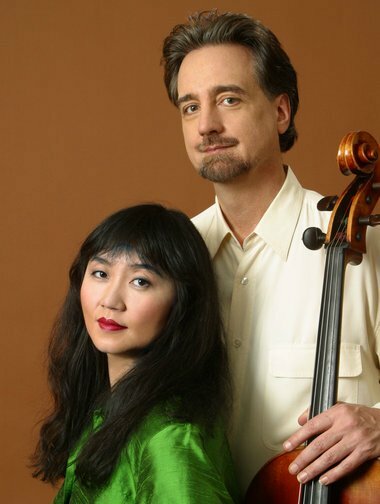 Cellist David Finckel and pianist Wu Han came to Concord Academy on Sunday with a monumental program: Bach, late Beethoven, Brahms, and Rachmaninoff. There was no doubt they would be up to the challenge since they’ve been among the most admired classical musicians for decades now. Can it really be that Finckel was the cellist for the Emerson String quartet for 34 years? And the couple is something of an institution. They are also the leaders of institutions: three terms as Artistic Directors at the Chamber Music Society of Lincoln Center, along with initiatives in Silicon Valley and Korea. With such weighty reputations and repertoire, it was something of a surprise that they chose to tackle this mountain of a concert not with impressive power, but rather with a nimble touch and conversational rhetoric. From the opening phrases of Bach’s Sonata for Viola da Gamba in G Major, BWV 1027, this was clear. Finckel delivered the initial line in the cello precisely but expressively, each note occupying its own space with its own individual inflection while preserving a sense of line. The piano’s response mirrored the cello’s melody but with a different personality: more centered, emphasizing purity of tone where the cello emphasized attack and decay. It was not an echo: but a sensitive, and different, response. The Bach set the tone for the afternoon, with the two performers complementing each other while retaining a sense of independence, and with the predominant mood being ruminative rather than extroverted. Han deferred to Finckel throughout the Bach, foregrounding the vocal character of Finckel’s playing, but sometimes muffling rhythmically active figures in the bass. Proceeding in chronological order, the sizable first half continued with Beethoven’s Sonata No. 4, Op.102 No. 1 for piano and cello, and then Brahms’s Sonata No. 1 in E Minor, Op. 38, for piano and cello. The Beethoven was written on the cusp of his late period, mixing together naive melody with a compressed developmental process; the minor key Brahms ends with an extended contrapuntal finale. These imposing works invite theatrical readings, but Finckel and Han resisted big gestures and instead cultivated an atmosphere intimate exchange. At times this made the works feel understated, but it also uncovered aspects that you might not have expected: a brusque exchange of Beethovenian fragments elicited laughter as it called to mind two people talking over one another. To be sure, the couple still knows how to bring down the house: that Brahms finale may have chugged away here and there, but the last page suddenly picked up steam and the final bars stirred us. The Rachmaninoff Sonata in G Minor, Op. 19 for cello and piano reminded me of the old joke about New England weather: if you didn’t like what you were hearing, wait a moment. Passages of lush wandering would always give up a phrase of beauty if you gave it enough time. The work is, no surprise, piano-heavy: Han didn’t worry too much about covering the cello, letting the piano wash over it when the music demanded it. The work is intensely demanding on the pianist, but the challenges seemed to energize her. Unlike in Bach, her left hand had no problem ringing out. But despite the romantic outbursts, the performance was still more interior than exterior, the tumultuous moments quickly calmed, the exchanges between the players marked by acute listening and immediate responsiveness. There was never a mere echo of interpretation. Instead, readings would generate interest by how they contrasted with one another. Though seemingly exhausting to play, it was calming to hear, as Rachmaninoff’s long-winded romanticism whiled away the late afternoon without perhaps engaging this writer fully. But lest you go away thinking Finckel and Han were simply taking it easy, conserving their strength, they returned with a breath-taking encore: the obsessive Allegro of Shostakovich’s Sonata for Cello and Piano in D Minor, Op. 40 played with relentless, savage, fighting intensity, as if to prove that the approach of the afternoon was merely one among many, and sent a bolt into the audience, sending them out into the heavy afternoon rain buzzing with energy.